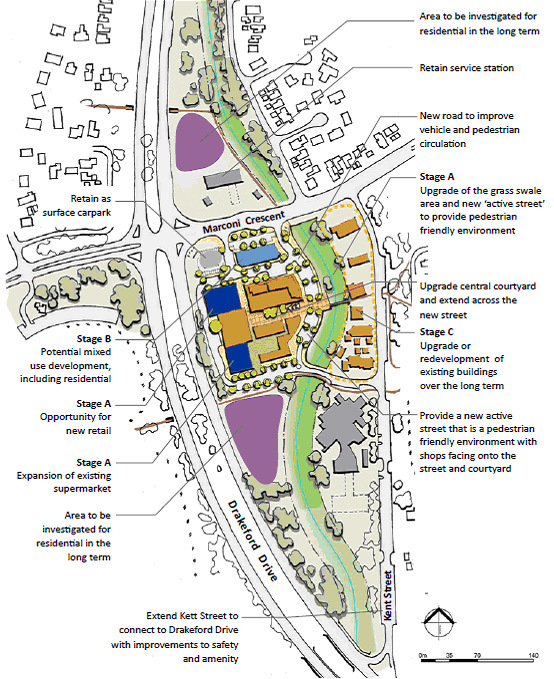 The ACT Government has endorsed the Kambah group centre master plan. It defines what is important about the Kambah group centre and how its character and quality can be conserved and improved. It sets out principles and outcomes to manage development and change. The master plan is not a detailed design, but a guide for future development and redevelopment. The Kambah group centre master plan newsletter summarises the master plan. Below is an indicative drawing that illustrates how the centre can grow and change over time. The community will be involved at each stage of development, either through consultation on changes to the Territory Plan, upgrades to the public realm or notification of development applications. The community has been involved throughout the development of the master plan since March 2011, providing valuable feedback at stakeholder interviews, two drop-in sessions at the centre, community surveys, newsletters, emails and public meetings. The ACT Government received 98 formal submissions on the draft master plan including strong messages about protecting the village character of Kambah. Prepare a precinct code that specifies planning controls, such as land use, building height and design details. Undertake investigation and documentation to allow for land release. Identify and prioritise capital works proposals for public space and infrastructure improvements for consideration in future budgets. Opportunities exist for the private sector to invest in the centre, which can help realise the community’s vision. A number of the changes proposed in the master plan are on sites already leased and change here may occur when it is appropriate and viable to redevelop. The community will be involved at each stage of development, through consultation on changes to the Territory Plan, upgrades to the public realm and notification of development applications. Where can I get the master plan? The master plan is available to download at the top of this page or pick up a copy at the Erindale and Tuggeranong public libraries.